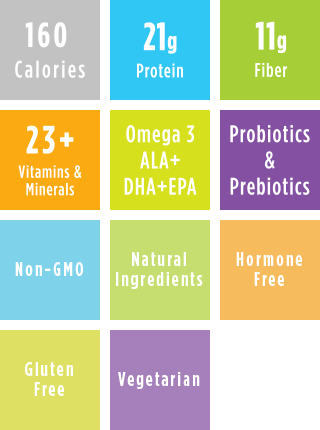 CHAI NUTRITIONAL SHAKE contains Non-GMO, gluten free and natural ingredients that includes U.S. Grade A rBGH/rBST hormone free whey protein and milk protein blend, soluble dietary fiber, vitamins, minerals, Omega-3 fatty acids, digestive enzymes, probiotics and prebiotics. Infused with a complex and soothing blend of natural spices, this highly nutritional and delicious CHAI SHAKE offers inspiring comfort and wellness in every cup. INGREDIENTS: WHEY PROTEIN CONCENTRATE, MILK PROTEIN ISOLATE, SOLUBLE DIETARY FIBER, COCONUT SUGAR, WHOLE GRAIN OAT FLOUR, NATURAL SPICES WITH OTHER NATURAL FLAVORS, MILLED FLAXSEED, CHIA SEED, INULIN (CHICORY ROOT FIBER), ACACIA GUM, VITAMIN AND MINERAL BLEND (TRICALCIUM PHOSPHATE, MAGNESIUM OXIDE, VITAMIN C CALCIUM ASCORBATE, FERRIC PYROPHOSPHATE, ZINC CITRATE, VITAMIN E ACETATE, NIACINAMIDE, COPPER AMINO ACID CHELATE, MANGANESE AMINO ACID CHELATE, CALCIUM D-PANTOTHENATE, CHROMIUM AMINO ACID CHELATE, VITAMIN B6 PYRIDOXINE HCL, VITAMIN B2 RIBOFLAVIN, VITAMIN B1 THIAMIN HCL, VITAMIN A PALMITATE, BIOTIN, FOLIC ACID, BETA CAROTENE, IODINE AMINO ACID CHELATE, SELENIUM AMINO ACID CHELATE, VITAMIN D3 CHOLECALCIFEROL, VITAMIN B12 CYANOCOBALAMIN), POTASSIUM CHLORIDE, POTASSIUM CITRATE, GREEN TEA, XANTHAN GUM, GUAR GUM, STEVIA, ENZYME BLEND (AMYLASE, PROTEASE, LACTASE, LIPASE, CELLULASE), CHOLINE BITARTRATE, MONK FRUIT, OMEGA-3 FATTY ACIDS (ALA, EPA, DHA), PROBIOTIC (BACILLUS SUBTILIS), CINNAMON. DIRECTIONS: Mix 2 scoops or 1 packet (1.76oz) of NUTRITIONAL SHAKE with 8 – 10 oz cold water or milk in a shaker cup, shake well for 15 – 30 seconds or until smooth.